This month's Et Al. focused on STD screening in the juvenile justice population. Here's a quick Q and A with the authors. Click here for the resource page for this webinar. Given the high rates of infection, all youth should be screened often and as quickly as possible when admitted to a Juvenile Justice facility. Other implications include establishing public health partnerships with correctional facilities in order to reach priority populations for both screening and treatment. These partnerships may include data sharing agreements, approving correctional facilities and/or contractors as 340B covered entities, written or verbal communication, and sharing staff contact lists. How can the findings from this article promote a change within the way an STD program uses partner services? Incarcerated youth are often overlooked and fall into health care gaps. The findings in this article really promote targeting these youth and working across systems to ensure they are screened and appropriately treated. Additionally, collecting and tracking data improves testing and education for the juvenile justice system (JJS) staff on the importance of detection and treatment. There is more research needed regarding the high-risk activities of this population and the availability of resources to target these behaviors. Research could also include linkage to care rates, identifying testing behaviors outside of a correctional screening, and expedited partner therapy (EPT) utilization. 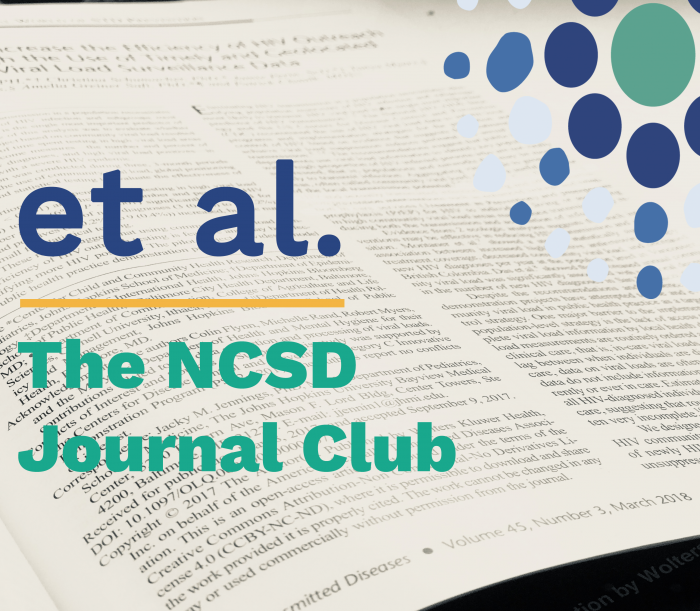 Save the date for the next journal club in February 2019. With questions, contact Leandra Lacy, Manager, Capacity Building.